FREE UK DELIVERY + £10 OFF YOUR 1ST ORDER. Enter code NCD10 at checkout and click recalculate. This is a pretty 1930s vintage jewellery box, made in Sorrento, Italy. 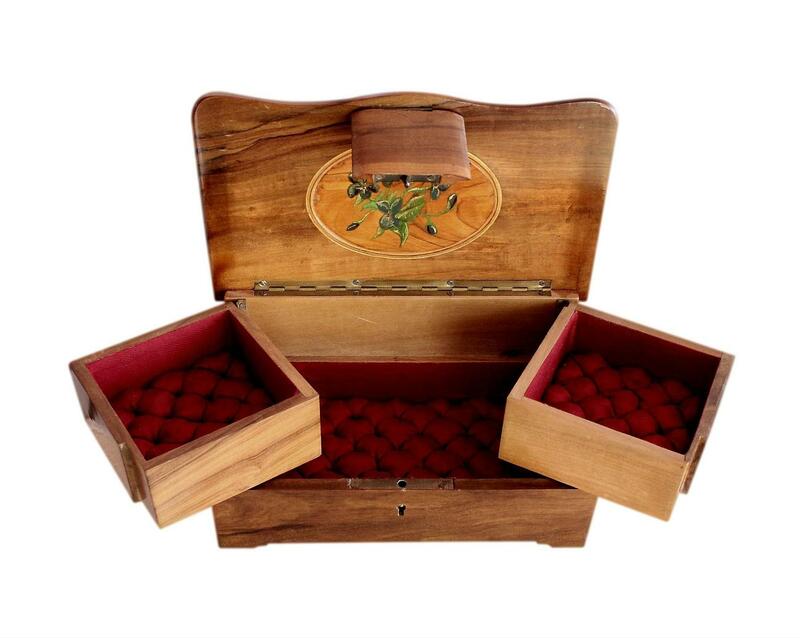 It is made of Olive wood and is beautifully decorated. 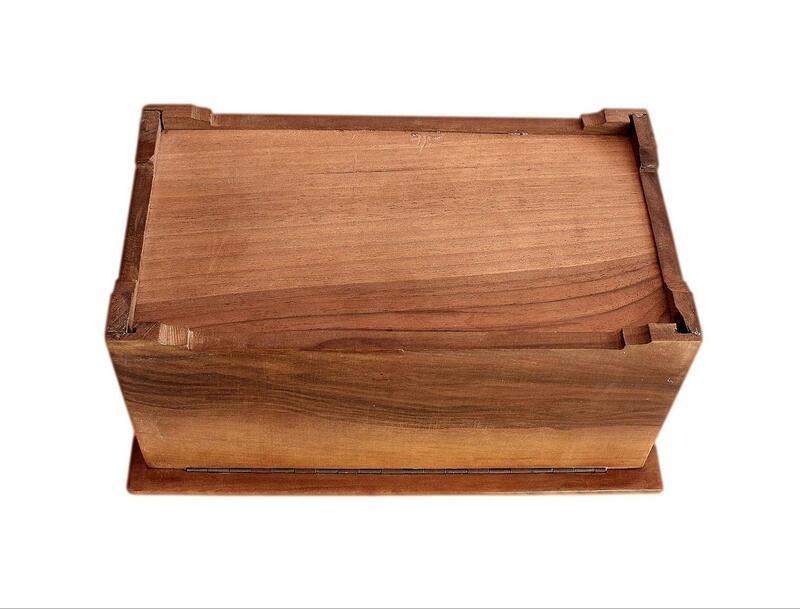 This box is made of solid Olive Wood which has a beautiful colour and superb figuration. 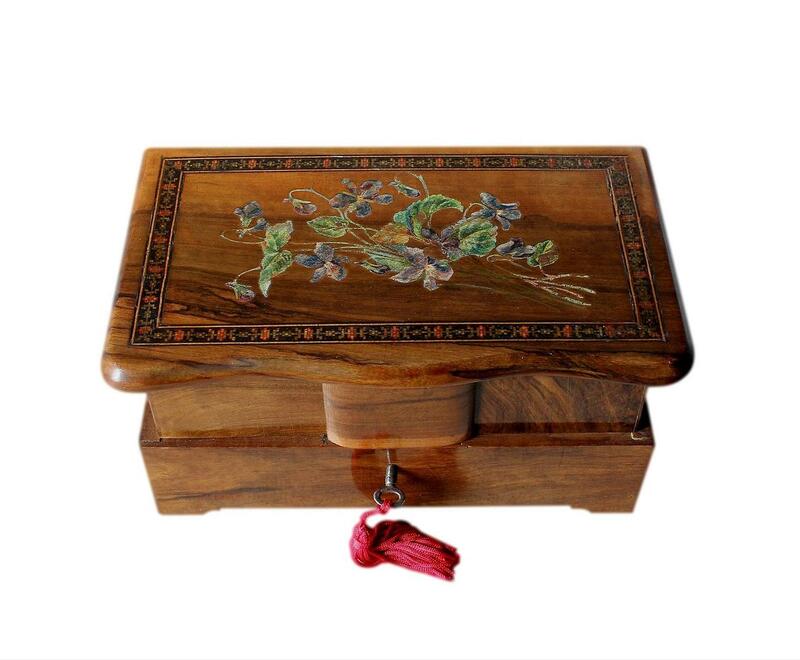 The lid has a beautiful hand painted floral scene and a beautiful inlaid micro mosaic border. This type of mosaic inlay is known as 'Tesselation' and a description of this is given below. The box is complete with its original piano hinge and its original working lock and key. This type of inlay is skilfully created with hundreds of tiny pieces of wood. It is painstakingly put together over many, many hours, to form a beautiful mosaic pattern. Several varieties of wood are used to add colour and dimension to the mosaic. Olive wood has a distinctive grain and rich colour, and characteristic brown and yellow streaks. Olive wood is also favoured for its hardness. 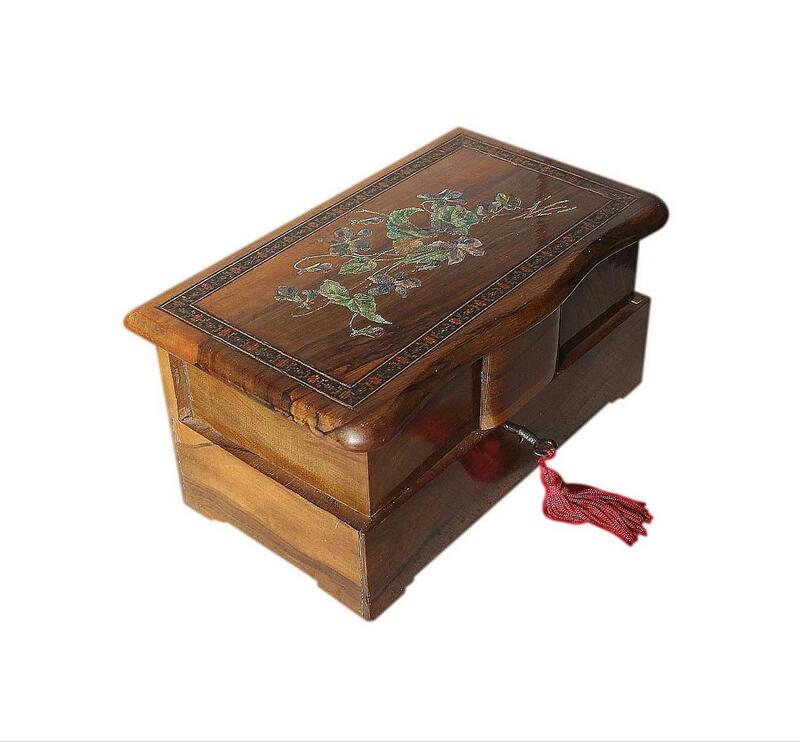 It is a strong durable wood with a fairly high density, and it takes well to cutting and polishing. The interior has two hinged compartments at the top which swing open on either side. Beneath these is a further larger compartment. 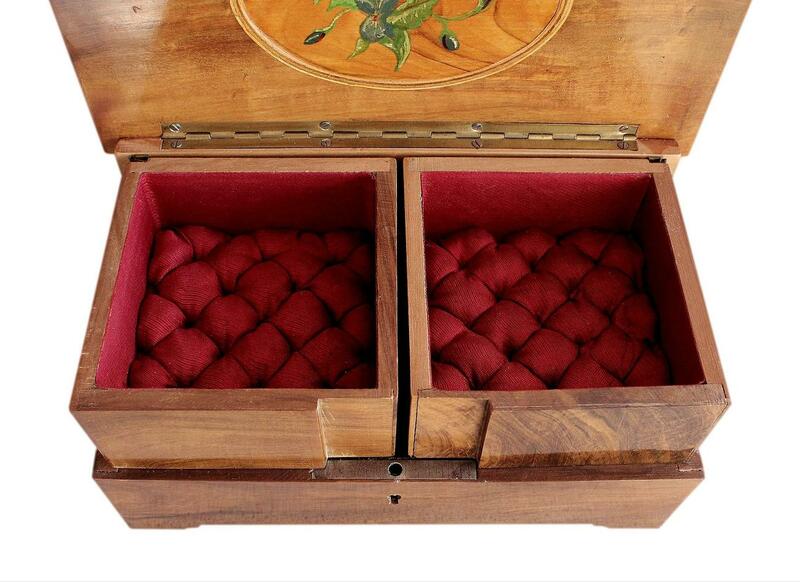 All of the compartments have their original silk panels which are deeply padded and beautifully quilted. The walls of the compartments have their original silk linings. The silk is a lovely deep red shade. The inside of the lid has a new oval Olive wood panel, neatly fitted within the original inlaid frame. This has beautiful hand painted flowers which compliment those on top of the lid. The panel was made and fitted by our skilled box restorer, to replace a broken mirror. The painting has also been done by our restorer and is completely unique to this box. This wonderful old box is in very good condition for its 80 plus years of age. It is of very sound structure and has no nasty chips or cracks. The interior silk is still in excellent condition with no splits or fraying. The hinge is still in perfect working order and the box locks securely. There is minor rubbing to the painting and minor distortion to the inlay in a few areas. This is commensurate with age and honest use. It is not damage. We would like to make you aware that vintage locks can occasionally malfunction. They are already very old and will naturally have some wear from age and use. We are not responsible for locks that malfunction from further age and use, once boxes are purchased. The lock will be checked prior to posting but please ensure it is still working as soon as you receive your box. Thank you. 7.7cm square with a 2.5cm depth. 17.4 by 8.3cm with a 2.5cm depth.